Proud to call Boardwalk and Wilderness Lodge home! Congrats! Welcome to DVC, nice choice on CCV. Please feel free to post a trip report. I am desperate to buy at CCV and would love to hear your report first hand! Warning!!! You will soon have 'add-on-itis!' I have it! we own at BRV (formerly VWL) and we love the whole experience there from piped in crickets to mystical indian flute music and dining and counter service options (and even the boat rides to and from parks and adjoining resorts). There is horse back riding at the wilderness campground and horse drawn carriage & wagon rides, too. Boat rentals and fishing, too. Am I the only one not familiar with this site for countdowns? Can you tell us more like is it your creation? etc! Well now I don't see your banner in your post. Did I make it disappear? Just wanted to say Happy for you and your family. Cool memory to have signing on dotted line while on a Disney cruise and making plans for next trip already. Can't get any better than that. Copper Creek is now a beautiful location to own. 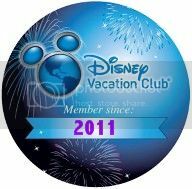 It was awesome for all of us VWL/BRV owners and now we are all one big happy family!